The holidays are a time of year when well-loved traditions are enjoyed. Since our family does not live nearby we get together with our group of friends and enjoy delicious food, beautiful music and a relaxed time that comes with knowing each other for many years. I am here to assure you that plenty of merriment ensues. Music will mainly consist of old jigs with the odd classical piece that will be performed by our quintet. I definitely need a boost before performing and that arrives in the form of home made English sausage rolls that are made by Tina. They are simply calorie heaven and a good stomach stabilizer that provides that boost. Croquembouche from Dawn that is simply amazing. Learn more about this beautiful dessert by clicking on this link. and the piece de resistance, Raspberry trifle from Jacqui. For the record, at our Christmas party I ask specific people to bring specific dishes as I am not a fan of waste and for me to insist upon Jacqui’s trifle speaks volumes as to how wonderful and naughty it is. Jacqui uses Harvey’s Bristol Cream sherry and she offers this helpful tip–do not buy the sherry too far in advance as there may not be enough left when it comes time to make the trifle! The recipe is simple, anyone can do it, and you can rest assured that there are never any leftovers. Spread the lady fingers with jam and place in the bottom of a trifle dish. 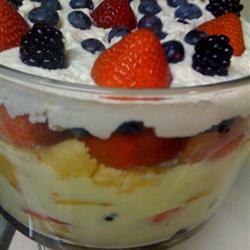 This entry was posted in Uncategorized and tagged english trifle, english trifle recipe, holiday dessert recipes, holiday meals, holiday recipes, holiday traditions. Bookmark the permalink.